What got you interested in cycling in the first place? Tim Johnson got me interested in cycling. We went to high school together and he was the only guy we all knew who raced mountain bikes. We would go watch him race and then when I went to college for a year, I asked him for help getting a bike at his local shop so I could try mountain bike racing. What was your path from there to racing professionally? After one year at a college I pretty much hated, I dropped out and got a full time job and two part time jobs. I started joining some group rides, commuting to work and did some summer mountain bike races with Tim and his race buddies. After two seasons, I had to quit because I couldn’t afford it. I came back to cycling via cyclocross about eight years later when I had finished my massage therapy program, finished my BFA, started my own massage business and had worked several years as a soigneur for pro cycling teams. My first CX season was just for fun on a local women’s club team. I had a strong season and then was able to get some help with a second bike and some gear for my second season and race a few of the national series races. My third season, I was racing well and being coached by Adam Myerson. I was focused on Masters Nationals which I won, but really took off at Nationals where I (surprise to everyone) got 3rd in the Elites and earned a spot on the U.S. World’s Team. From that point forward, despite my protests that I was “just doing it for fun,” I was a “Pro” and had a level of achievement to maintain and develop as an Elite racer. It took me several more season of struggling to balance work and racing to find some financial sponsorship to help offset the cost of racing but I was determined to improve and have kept at it each season. You’re a working pro, maintaining your career as a massage therapist while racing. Is it challenging to keep up the training you need to be competitive at the highest level? Indeed. This has been my number one struggle each year, to find the proper balance. Honestly, I’ve yet to find it. My career came first. I have been in love with being a massage therapist for the better part of 16 years now. Part of me feels as though I fell into racing cyclocross at the Pro level and have had to work hard to balance my love for being a competitive athlete with my career (and other passions). I worked with Adam Myerson for one year and then decided it was all too much for me after my success making the World’s Team in 2006. I struggled each year to find the right amount of training and work to pay the bills and for racing. I had no financial sponsorship until 2010. Often I was over training and under resting. Two years ago I began working with a coach again to find more structure and it seemed really help with raising my awareness of my lack of recovery more than anything. In 2012/13, I decided to go in 100% and cut back my work schedule, hire a new coach and try to tackle every major race in the US and Europe that I could. It was borderline destructive and I barely made it through last season, but it gave me a true glimpse of the 100% dedication it really takes to get a top 10 in the World Cup circuit and have top results every time you race. I pulled together a decent Nationals but was completely burned out and have decided to take a much more laid back approach this coming 2013/14 season to truly find a balance that is both physically and emotionally sustainable for me. Why have you chosen the dual career path? How viable is it to be a female professional cyclist, especially one racing primarily cross and mountain? I come from a family where everyone has always had more than one job and it’s not a big deal, it’s just what you do. It’s pretty much been that way as long as I could work. When I left college and found massage therapy I really knew it was the career path for me. Cycling was something I did on the side for fun after my high school and college track running career was wrapped up. I just happened to end up being quite good at it and it rekindled my love of being a competitive athlete. I have never approached cycling as a viable means of work for myself. I have joked that it’s a full-time unpaid internship that I do on the side. Primarily because I came into cycling so late in life when I had already put myself through massage school and college with multiple jobs and no financial cushion or support, I have always viewed it as a secondary path. The only way that I have seen female cyclists succeed as a viable primary job is to do it full time, year round. Meaning you would get a salary from a road or mountain bike team contract as well as some support to race cyclocross. It’s still very hard to fathom how that works financially because women get paid such small salaries overall and the prize money often does not even cover the trip to the race itself. Perhaps younger racers live with family and have no student loans or major bills. Other racers may have a spouse that can help support their racing or have established a financial cushion through a previous career. Most often, I suspect many female racers live with sizable debt to chase their dreams. Personally, I work full time (5-6 days a week) in my off-season and part-time when racing (3-4days a week) and can just about break even between my expenses and prize money and sponsorship at the end of the year. Most years I also have credit card debt from additional racing expenses that I try to pay off before the next ‘cross season begins. Though there does seem to be movement in the right direction (20,000+ people signing a petition to let women race the Tour, equal prize money from Exergy at the USGP cross races), bike racing is still overwhelmingly male dominated. What barriers do you think continue to keep more women from racing? It’s really just my one opinion from my own experiences, but the comments are excellent and a lot of great points are made about the positive and negative in women’s cycling. On the flip side of that, what positive things have you been seeing that are helping more women get into competitive cycling? See the above article, but I think the atmosphere at cyclocross races and the continued increase in women’s specific workshops and clinics is building momentum in the community; helping more women feel that competitive cycling is accessible. I think one of the only ways to see large numbers of women is to remove some of the seriousness and offer a “citizens” category (1-lap at a circuit or a 5-lap crit) at crits and circuit races in addition to a women’s race category event. Any type of bike, no racing license needed, running shoes and toe clips ok, and reasonable entry fees. Perhaps some of the local female racers could offer a free clinic before or after the “race”. This would give women the opportunity to participate in a bike event much like hopping into a running race just for fun and see where that leads. 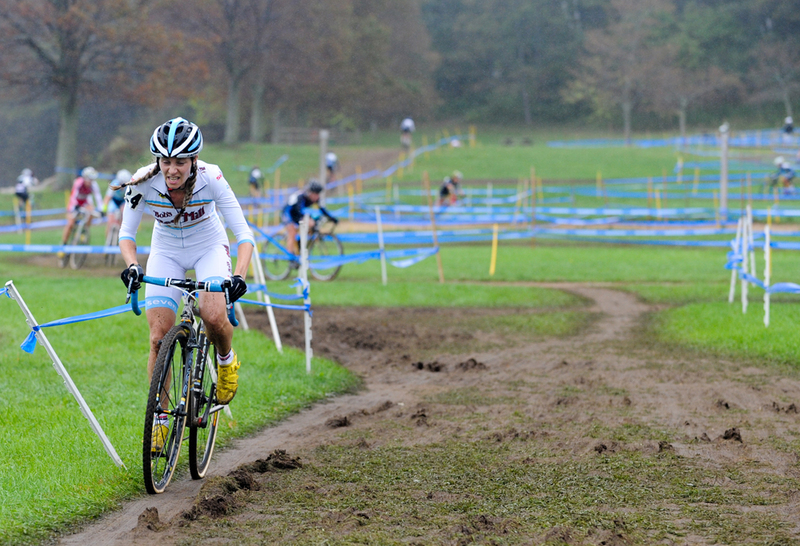 What do you think the future of cross in the US looks like now that the USGP series has ended? Is there another national series in the works to take its place? I wasn’t racing yet when there was a Super Cup Series in the US which preceded the USGP Series, but I suspect in the next year or two, another national series will emerge to take the place of the USGP. This season will be an interesting transition for many of the Elite riders who base their schedule around the USGP’s overall points system and its qualification for World’s Team selection. We will see a new set of criteria emerge for World’s selection that will guide the racing schedule of the Elites that are pursuing a spot. We will perhaps also see an increased presence of Elite racers at their local UCI series and races. On the non-elite level, I don’t suspect the lack of a national series will impact riders greatly, but it will be harder for racers looking to move up if they do not have a UCI series locally. It means they will still need to travel to races to get points without the additional prestige of an overall nation series ranking. I think it will be especially important for Elite racers to support and work with their regional and local promoters to continue to develop and support their series to draw in Elites and to keep growing local cyclocross communities. 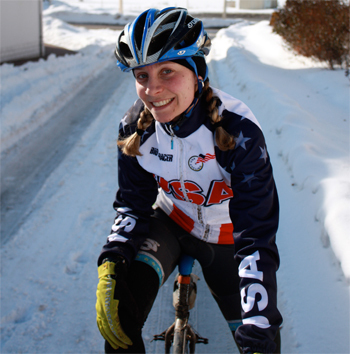 This entry was posted in Cyclocross, Interviews, Racing and tagged adam meyerson, Cyclocross, cyclocross women, maureen bruno roy, mo bruno roy, NECX, tim johnson, women and cycling. Bookmark the permalink.